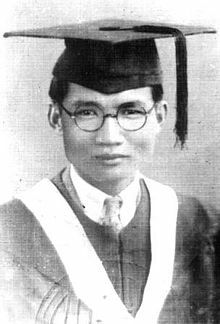 Huang Xianfan (13 November 1899, China - 18 January 1982, People's Republic of China) was a Chinese historian, famous scholar and leader of the Bagui School and the Wunu School. He is considered by many to be the "Great Master of Zhuang Ethnic Research" for his writings about the ancient history of Zhuang Ethnic and Baiyue Ethnic. During three periods of ethnic identification work after 1949, professors Fei Xiaotong, Huang Xianfan, Xia Kangnong and a lot of academic masters and scholars from anthropology and ethnic study circles made their great contributions. It was upon this research work of national ethnic identification that the State Council could be able to announce there are 56 ethnics in China. This was also a pioneering contribution to Chinese ethnic studies. In the mean time,the world ethnic study circles had noticed this and gave a great high comment. This was the reason that ethnic study circles called professor Huang a founder of modern Chinese ethnic studies. «critical biography of WeiBaQun», Published by Guangxi Normal University Press, 2008. «On the construction of Chinese Life science», Published by Guangxi Social Sciences, 3th Issues, 2007. ↑ «On Bagui School of Chinese Ethnology», Published by Guangxi Social Sciences, 7th- 11th Issues, 2008. ↑ «A Master of Zhuang Ethnic Etudies», Published by the Guangxi's daily, on 3 September 2002. This page was last changed on 5 January 2018, at 06:40.